KNOXVILLE, Tenn. (AP) — Grant Williams scored 22 points and No. 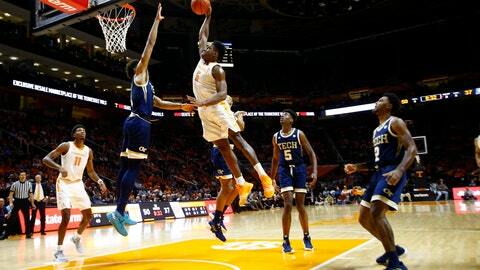 5 Tennessee used its stingy defense to beat cold-shooting Georgia Tech 66-53 on Tuesday night. Tennessee (3-0) was playing one day after moving up a spot in the Top 25 to earn its first top-five ranking since the 2007-08 season. After the Yellow Jackets made the game’s first basket, Tennessee scored the next seven points and stayed in control the rest of the way. Georgia Tech (1-1) shot just 27.6 percent from the field — its lowest mark since Josh Pastner took over as coach in 2016. The Yellow Jackets had nearly twice as many fouls (30) as baskets (16). They missed 15 straight shots during one stretch, including their first 11 attempts of the second half. Jordan Bone had 15 points for Tennessee. Brandon Alston led Georgia Tech with 16. BATON ROUGE, La. (AP) — Skylar Mays scored 19 points, transfer Kavell Bigby-Williams added a career-high 14 and LSU held off a relentless effort by Memphis under first-year coach Penny Hardaway. Each of LSU’s three freshman starters — Naz Reid, Ja’Vonte Smart and Emmitt Williams — scored 11 points. Williams also grabbed 10 rebounds for the Tigers (3-0), who trailed briefly with about 13 minutes to go before surging ahead for good with a pivotal 12-1 run that included back-to-back 3-pointers by Mays and Reid. Bigby-Williams, a transfer from Oregon, made all seven of his shots, all from close range, including an emphatic dunk that gave LSU a 10-point lead with seven minutes remaining. Memphis freshman Tyler Harris, scoreless in his debut, was 6 of 13 on 3s and finished with 20 points in his second college game. Jeremiah Martin scored 15 for Memphis (1-1).